When it comes to list the leading jazz bass players of the world one certainly has to mention Brian Bromberg. Brian is one of those musicians who prefer the bass as lead instrument. Depending on the situation, Brian plays a variety of acoustic, electric and electronic (MIDI) basses including fretted, fretless, piccolo, upright and synth. He doesn't let up in pointing out that there are no guitar melodies or solos on his recordings. All melodies and solos that sound like guitar are played by Brian on piccolo basses. 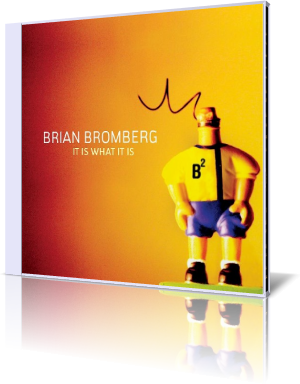 On his new album It Is What It Is Brian is joined by George Duke, Patrice Rushen, Jeff Lorber, Dave Weckl, Dan Siegel, Randy Brecker, Eric Marienthal, Richard Elliot, Gerald Albright, Rick Braun and more! Brian is one of those rare musicians who offer a combination of jazz and smooth jazz on the same album. Brian admits: “I was very closed- minded with tunnel-vision. But I grew up and realized I didn’t have the right to judge anyone for the music they want to play. I came to understand that musical validity is totally subjective. That’s when I began to stretch my own music into contemporary jazz and began playing on movie soundtracks and with pop, rock and world music artists”. This opinion has influenced a great phase of his career and so Brian is certainly a smooth jazz artist but has also flies the flag of a "serious" jazz musician. That said the title track It Is What It Is understands oneself as a confession to jazz in its pure form. With an elitist set of musicians like Randy Brecker, Jeff Lorber, Tony Guerrero Brian can produce the finest jam session one can imagine. Most of the tunes of the album are written and arranged by Brian Bromberg. Nevertheless tracks like the B-52s Love Shack shows the funky signature of Jeff Lorber. Brian pulls all the stops on his breathtaking slap bass solo and pushes the tune with further stakes to a fulminate finish. The essence of funk is to find on Excuse Me?, slap bass and horns at its best. Brian Bromberg is without no doubt in the same league as Stanley Clarke or Marcus Miller. Brian's album doesn't confine itself on technique, funk and power. With Life Brian generates a dream of emotional romance featuring Dan Siegel on keyboards and George Duke on piano. On Elephants On Ice Skates Brian demonstrates more of his fantastic skills on the diverse basses while the cornucopia horns is overflowing the listeners with sax, trumpet and trombone, everything you can possibly wish. The Mirror is featuring Brian Bromberg on a tenor bass solo creating a melody in a personal bass style. Quincey Jones composed the theme Sanford and Son for the same-titled sitcom on the NBC television network. The genius of Quincey Jones is perfectly revived in this brilliant jazz tune featuring Rick Braun on muted trumpet and Brian Bromberg on furious upright bass. Do you like some Martinis at the Velvet Lounge? A Samba flavored tune with a wonderful string arrangement by Tom Zink (The Rising Sun Orchestra, Tokyo) and Gary Meek's easy going flute. Saul Goode is pure musical joy on a very high level. Brian Bromberg's bass interpretations of the main theme reflected by Gerald Albright on sax and keyboardists Dave Kochinski and Jeff Lorber, that's finesse, subtle brilliance. Reunite fretless bass and strings to a sultry melody. The result is Heaven. But hey, this is Brian Bromberg and the result is a fretless bass solo. The closer of the album Slap Happy clears up the view. Brian Bromberg and bass, the bass land of unlimited opportunity dreamt. Lick up the final notes. Brian Bromberg sets a new benchmark in bass performance. That's hard to beat for Marcus Miller, Stanley Clarke or Victor Wooten. The future has great things in store.